The need for effective management through management procedures that include harvest control rules, with associated reference points, is critical in modern tuna fishing practices. Members from Indian Ocean coastal states gathered in Colombo, Sri Lanka, to develop their understanding of the precautionary approach, management procedures and management strategy evaluation (MSE); an increased understanding and harmonized practices will contribute effectively to the progress of sustainable tuna fisheries resources. Representatives from the Indian Ocean Tuna Commission (IOTC) member countries were invited by the Common Oceans ABNJ Tuna Project and partner World Wide Fund for Nature (WWF) to take part in a workshop with the objective to accelerate the development of tuna management procedures within the Indian Ocean, and empower coastal states to engage in future developments. The two-day program consisted of a unique agenda built on presentations of harvest strategy frameworks and the principles of sustainable fisheries management. International experts, including International Seafood Sustainability Foundation (ISSF), with specific experience and expertise, introduced both general management procedures as well as procedures within the context of the Indian Ocean. Key concepts such as the precautionary principle, the process of establishing tuna management procedures, and the use of MSE to evaluate harvest control rules, were discussed in small groups to address specific needs and issues. During the final day, a MSE simulation was conducted, allowing the participants to reach an in-depth understanding of the concepts and procedures. "The aim of this project Indian Ocean workshop is to create a better understanding among Indian Ocean States of the precautionary approach, harvest strategies, and management strategy evaluation for sustainable tuna fisheries to increase confidence in applying concepts in Commission settings, in-country training, and engagement of managers, fishers and stakeholders. Sri Lanka has a large dependence on tuna in which the management is highly technical and therefore needs to be understood by planners, managers, and all actors from Sri Lanka to have a successful tuna industry," said Mahinda Amaraweera, Sri Lankan Minister of Fisheries & Aquatic Resources Department. 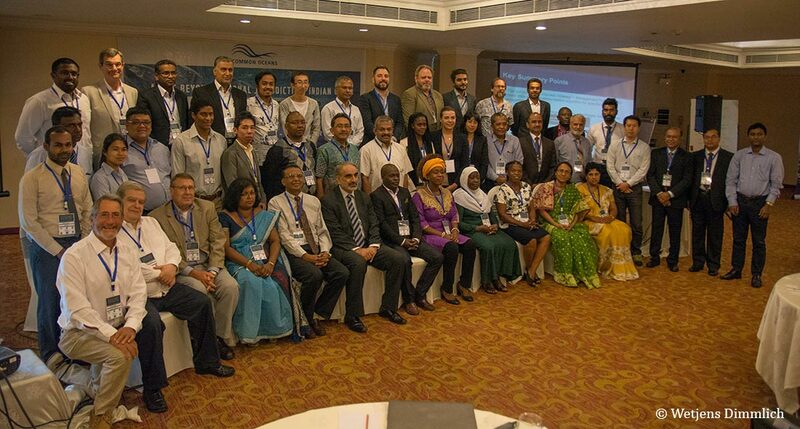 The workshop, developed and led by Ocean Outcomes (02), is the second for the Indian Ocean region, and fourth tuna management workshop promoting improved understanding of management procedures and MSE in tuna fisheries. Support provided during the first Indian Oceans workshop, together with the concerted efforts of many other players in the Indian Ocean, culminated in IOTC adopting its first harvest control rule for Skipjack tuna, an important step towards increased sustainability. "The marketplace for seafood is changing faster now than ever before. Consumers are being taught to look for sustainably produced product and seafood sellers are responding by demanding supplies from sustainably managed sources. The ABNJ workshop series is equipping IOTC delegates with the necessary understanding of key fisheries management concepts they will require in order to make the important decisions that will establish the Indian Ocean as the source for sustainable tuna," said Wetjens Dimmlich, Indian Ocean Tuna lead at WWF. This series of workshops is part of a broader support strategy by the Common Oceans ABNJ Tuna Project aiming to facilitate the implementation of the precautionary approach at the tuna RFMO level. The Common Oceans ABNJ Tuna Project, funded by the Global Environment Facility (GEF) and implemented by the Food and Agriculture Organization of the United Nations (FAO), harnesses the efforts of a large and diverse array of partners, including the five tuna RFMOs, governments, inter-governmental organizations, non-governmental organizations and private sector to achieve responsible, efficient and sustainable tuna production and biodiversity conservation in the ABNJ. See photos of the workshop, organizations involved, and workshop contacts on the Common Oceans website.